Once, thanks to an article in Martha Stewart Living, I was convinced that I would buy nothing but Heywood-Wakefield furniture and fill my home with a carefully curated collection of this fine example of Mid-Century Modern furniture from the 1940s and 1950s. 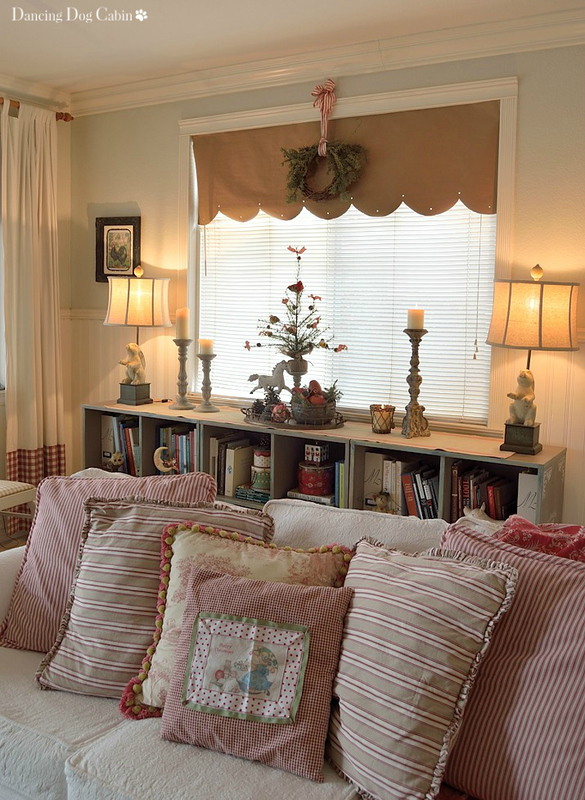 At that time, my approach to decorating leaned very much in the direction of a more contemporary style. I quickly discovered that Heywood-Wakefield furniture was (a) hard to find (this was long before the Internet, EBay, Craigslist, etc.) and (b) very expensive. This was back when Shabby Chic had first become so hugely popular and it was very difficult to find furniture retailers that carried anything that looked like Mid-Century Modern, except for Ikea. It goes without saying that Ikea was, and is, a great resource for very reasonably priced furniture with a contemporary/modern (especially Swedish Modern) vibe. So, in my early decorating days, I bought a lot of stuff from Ikea. Back then, I would have been thrilled with today's Mid-Century Modern, Urban-Contemporary, etc. trends. Now, not so much. My decorating style has made a 180-degree turn and is now firmly Traditional-Country French-English Country-Cottage, with regular excursions into Rustic Cabin Chic (for wont of a better term) territory thanks to our cabin project. Funny how one's style evolves, huh? I still have a few lingering Ikea pieces that I haven't gotten around to replacing, one of which includes this bookcase that I have been using to house all of our cook books, and my home decor, crafting, and DIY books. I love that it is actually three separate units that can be pushed together to form one long, low unit that functions as both a bookcase and a display console. I love that each unit has four deep cubbies that can accommodate large books, serving ware, or anything else I want to display. I do not love, however, its blond laminate wood and melamine finish, and its obvious Ikea origin. I had toyed with the idea of replicating the bookcase in a more rustic pine plywood (or perhaps in salvaged palate wood) and then giving it a more Country French treatment. However, after all the recent hard labor on our cabin, I decided neither me or my husband were up to building three pieces of furniture from scratch, and that the better course of action would be to re-purpose the 'bookcase' and turn it into a cross between Vintage Industrial and my idea of old, distressed Country French utilitarian. So.... here is my Ikea transformation project. 5. Paint brushes (including stencil brushes), fine and extra- fine sandpaper, colored pencil, regular pencil, scissors, lint-free cloths. According to the Annie Sloan painting instructions, I did not sand or prime the bookcase prior to painting. As I note above, the bookcase consisted of a high gloss, maple laminate finish on most of the surfaces, with a melamine surface on the cubby interior. 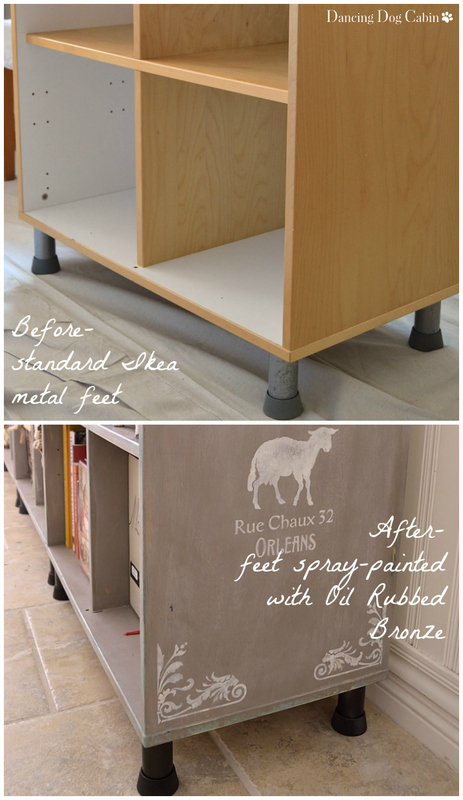 Once I got into the project I found that I should have ignored this advice and sanded/primed the bookcase, since the paint, even after fully dried, scrapes of very easily from these very slick surfaces. 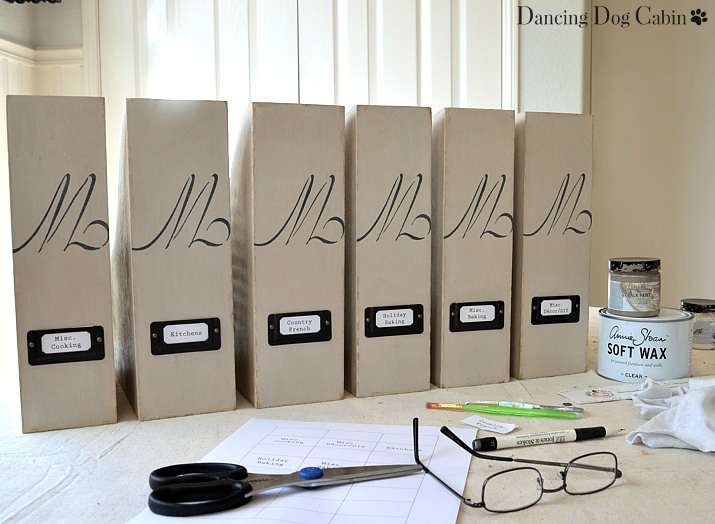 Once finished with the paint layers and distressing, it was time to move on to stenciling. 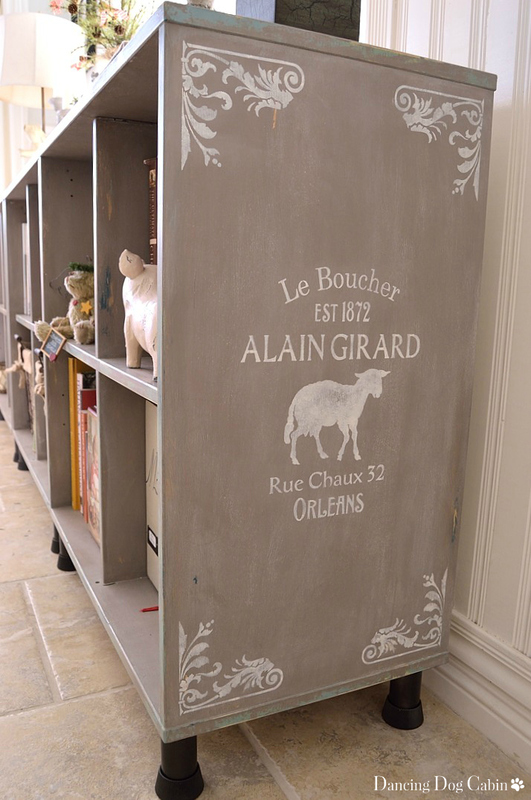 I went with this vintage French sign pattern to take the bookcase from old Ikea to re-purposed vintage French butcher-shop ('Le Boucher') storage cabinets. 1. I used a colored pencil to transfer the stencil pattern to a piece of paper. Once I was happy with the pattern placement, I stenciled the pattern to the side of the bookcase using a stencil brush and Old White paint. After the paint dried, I sanded the pattern lightly with a fine grit sandpaper to give it an old, distressed look. Lastly, I needed to do something about the feet. I thought about replacing the existing feet with wheels, but decided to take the easier and cheaper route and just spray paint the existing feet with Rust-Oleum Oil Rubbed Bronze. 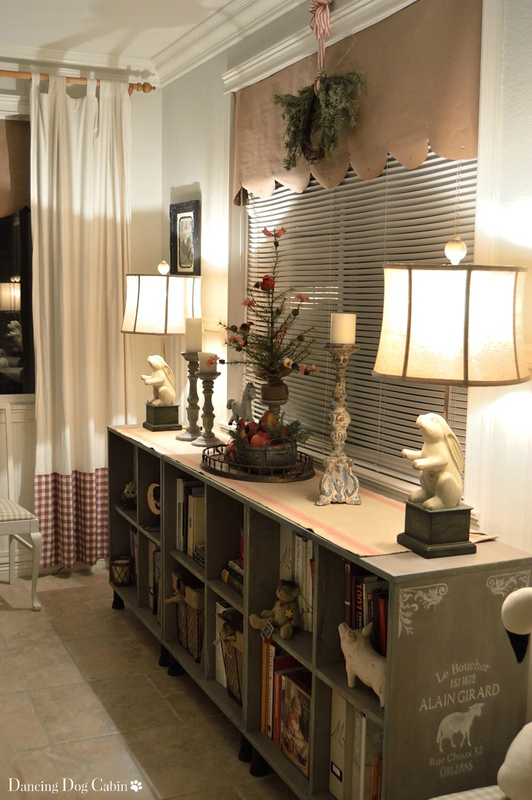 Recent Christmas joy on the 'new' bookcase-- this is why I wanted to get this bookcase transformed. It's so much more fun to decorate now! Another benefit of a bookcase composed of three separate units that are interchangeable is that I could apply a different stencil pattern on the sides of each unit, and then switch them around for an entirely different look on each end. I say I 'could'. I haven't done it yet....but I may tackle this additional refinement at some point in the future. The main lesson learned here is that if the piece of furniture has a very high gloss finish, you do need to sand and/or prime the surface before painting with chalk paint, otherwise the paint comes off at the drop of a hat. I have found, however, that furniture with a low- or no-gloss finish, does just fine without sanding or priming prior to applying chalk paint. I love it and I love how you have them styled too. I love what you did! We don't have an IKEA in the entire state of Oklahoma. Can you believe that? Thanks Brenda. I'm surprised you don't have an IKEA since it seems like they are everywhere. They look fantastic! Love the transformation. You wouldn't even know it's ikea!! Wow, that looks amazing! Love the stencil pattern. This is a great tip. I have an IKEA Expedit in our bedroom. We have added doors to some of the cubbies and baskets to others. I might just have to give it a fresh look. 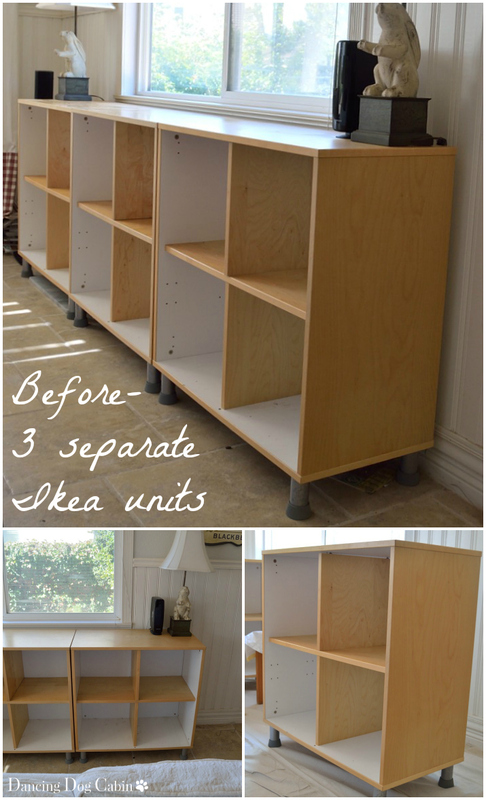 IKEA definitely has some great storage furniture. 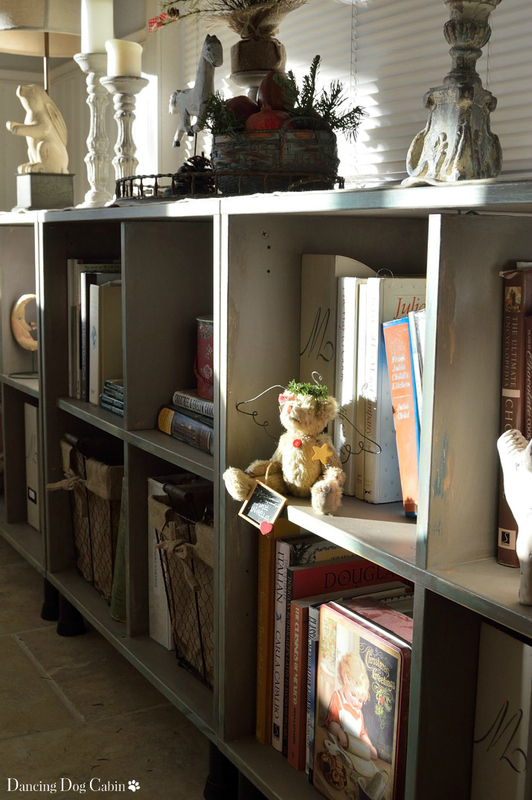 Melissa, I just love this bookcase! You did an awesome job on transforming it and it looks so beautiful!! Hugs! What an improvement! The bookcase fits in with your decor so well! I love it! I was just looking through an Ikea catalogue the other day and planning out my next trip there. This post has given me a lot of ideas! Thanks! I'm glad my post was a source of ideas for you! It's funny that my style has evolved the other way, from traditional to mid-century modern. 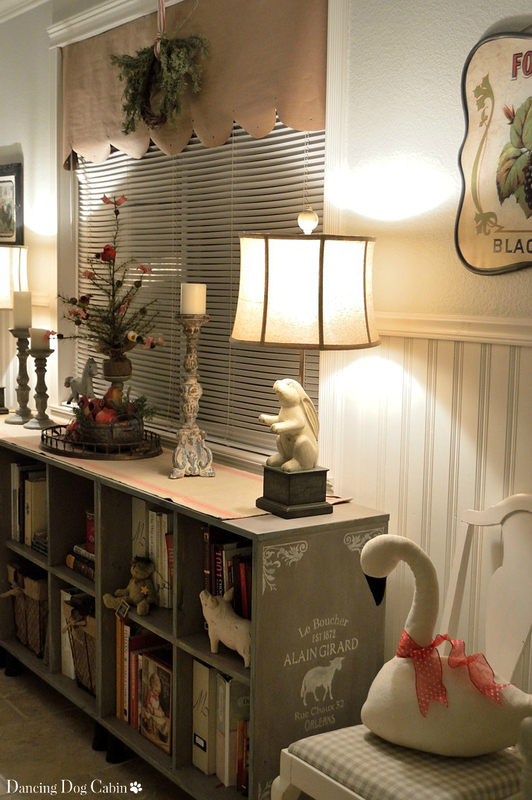 And, while it may not be my style, I think your bookcases are beautiful. They fit so well with your decor, and I never would have guessed that they were from IKEA. 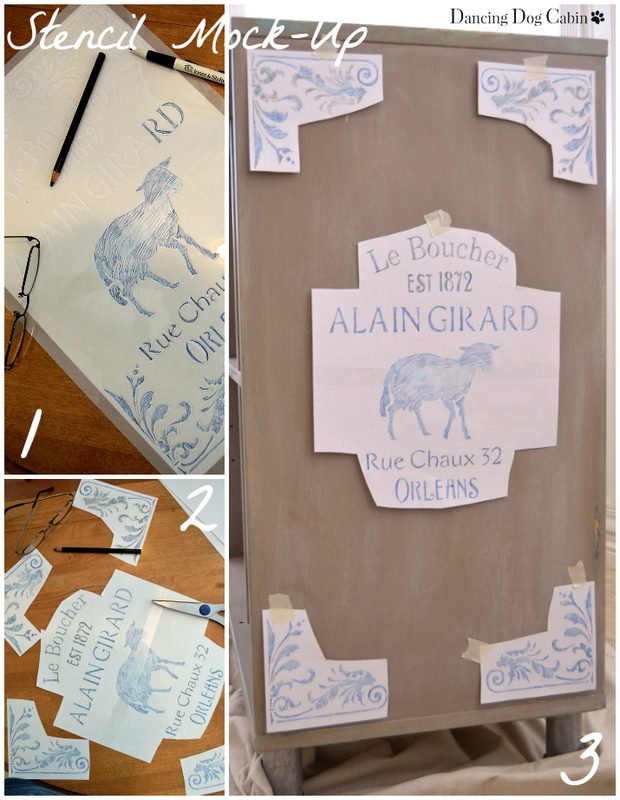 And your stenciling looks amazing. Thanks Rebecca! 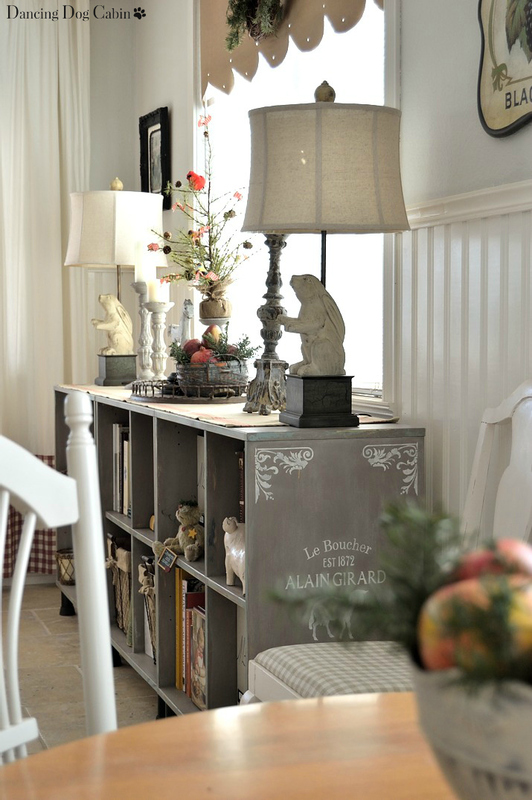 Seeing how everyone's decorating style evolves and changes is one of the things that makes it both fun and fascinating. I love it. Everything about it. I was wondering where you got your adorable rabbit lamps. Thanks Rhonda! I got the bunny lamps at an antique mall. There is no mark or label on the lamps so I don't know where they came from originally. I got the lampshades from the lighting department in Home Depot. Thanks Amy! I know the feeling of wanting to re-do everything! 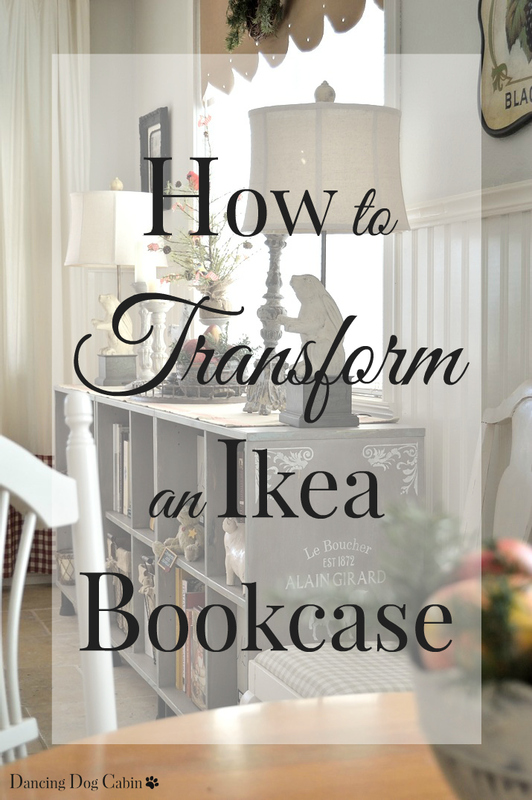 What an adorable makeover on that bookcase!! I love it! Thanks for sharing at Home Sweet Home! Absolutely beautiful! Where did you find your bunny lamps? They are adorable. Thank you! I bought the lamps at an antique mall in Old Town Temecula, California and I got the lamp shades at Home Depot.